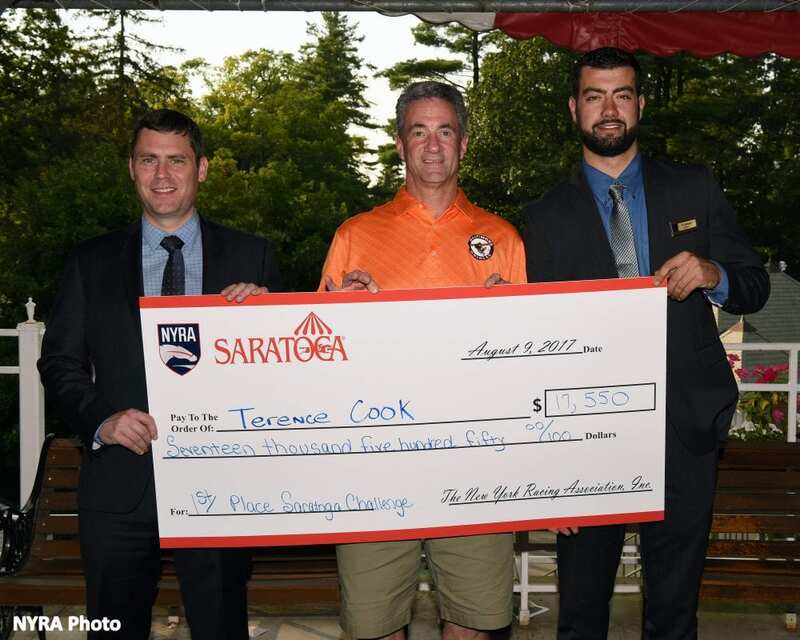 On the first day of the Saratoga Challenge, Terence “Terry” Cook had to come from behind in the last race to capture first place. On Thursday's handicapping contest exclusively on live racing at Saratoga Race Course, Cook and his partners Mark Komen, Mark Saperstein and Bob Schmidt compiled a bankroll of $10,092 to capture first place, winning $19,350 and a seat in the 2018 Belmont Stakes Challenge . Thanks to a tip from Mark Komen's brother Jeff, the group decided to include longshot Pegasus Red in a $210 straight exacta bet with favorite Sudden Surprise in Race 7. The live money bet paid off to the tune of $10,342.50, catapulting Cook and his partners to the top of the leader board where they would remain. Randy Gallo finished second in Thursday's Saratoga Challenge with a bankroll of $3,720.10, winning $9,675 and a seat at the 2017 National Handicapping Championship. His son, Randy Gallo Jr. took third place with a bankroll of $2,575. He also wins a seat at the 2017 NHC and took home $7,740 in prize money. In Wednesday's Saratoga Challenge, Terry Cook and his partners took home $17,550 as well as an entry into the 2018 Belmont Stakes Challenge. This entry was posted in Horseplayers and tagged Handicapping, Horse Racing, horseplayers, nyra, saratoga challenge, terry cook, thoroughbred by NYRA Press Office. Bookmark the permalink.